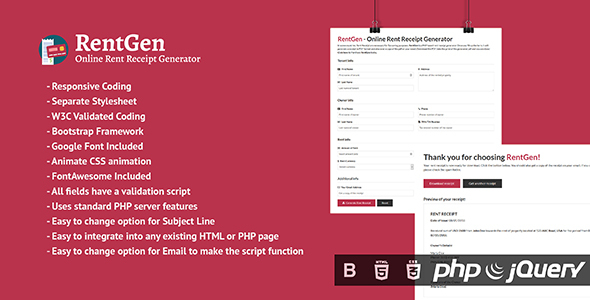 RentGen is a PHP based rent receipt generator. Once you fill up the form, it will generate a receipt in PDF format and also send a copy of the pdf on your email. Download the PDF, take the print of the generated pdf and you are done. It’s Bootstrap based PHP form. It can be easily customized as it is well documented and developed using latest web technologies. This form will be a perfect choice for those countries where Rent Receipt are necessary for Tax saving purposes.